Hat tip to Gilbert Riddle who commented on my previous post and several others who have pointed me in the right direction to identify the mysterious fighting wife from Oliver’s letter of 16 March 1862. She is the legendary Kady Brownell, wife of Robert Brownell of the 5th Rhode Island Infantry. Oliver incorrectly identified the unit as the 4th Rhode Island. This is understandable given that the 4th and 5th were part of the same brigade. Kady Brownell is legendary not only because of what she did during the Civil War, but because of the post-war publicity she received for these deeds. The story of her actions, particularly at the Battle of Newbern on March 14, 1862 seems to have grown and changed with each retelling. Today, sorting fact from fiction is difficult for those who attempt to uncover the true Kady Brownell. …a woman that goes with them wherever they go. – Most of the accounts of Brownell confirm that she followed her husband from April 1861 when he joined the 1st RI Infantry, a three-month unit, until he later enlisted in the 5th RI participating in Burnside’s operations on the coast of North Carolina. She dresses in bloomer costume with black pants, a closely fitting bodice with a skirt coming nearly to the knees, men’s boots with her pants tucked inside and a nice velvet hat. 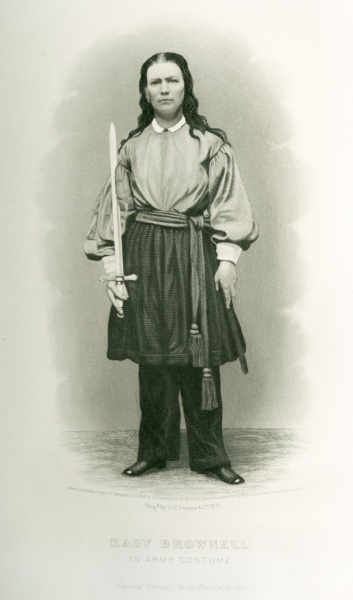 – Although later photographs presumably taken for publicity purposes depicted her in a Zouave uniform, Oliver’s description of her attire matches most of the contemporary accounts. Kady Brownell pictured in a post-service "Army uniform"
I saw her with the regiment Thursday straining through the mud with her blanket on her shoulder, equal to the best of them. – Accounts of this march toward Newbern do confirm that Kady was marching through the mud with the men of the regiment. However, a story about one of the male soldiers giving Kady his boots seems to be suspicious, but Oliver’s eyewitness account of her attire does note her wearing “men’s boots” whatever the source of supply may have been. There was one of the officers’ aides riding one horse and leading another one when he came up to where she was. She jumped on to the horse as easy as any man. It was the first time I ever saw a woman ride a horse like a man. – I did not find this part of the story in any other descriptions. However, there are accounts that Kady’s shoes were destroyed during the march and that she was so exhausted that she cried on her husband’s shoulder. [On the morning of the battle, 14 March 1862]…the regiment formed in the road close by her; she was ahead carrying the flag. – There is some historical dispute as to whether or not the unit even had a set of colors at the time of the battle. Oliver, as an eyewitness, confirms that indeed Kady was carrying the unit colors on the morning of the battle. She went with them into the battle field and ran some very near chances of being hit, the shell of one bursting close by her side. – Most of the contemporary descriptions of her actions during the battle attest to her bravery under fire. In fact, she is credited with preventing a fratricide incident between the 4th RI and the 5th RI. Although Oliver doesn’t mention any of these details, he confirms she was in the thick of the fighting. Marched in the ranks through the shriek of the shell? Who was their comrade, their brave color-bearer? Who but the resolute Kady Brownell? She, the intrepid one, Kady Brownell! Who so undaunted as Kady Brownell! Who higher hearted than Kady Brownell? Forward, straight forward, strode Kady Brownell. What did she see there- this Kady Brownell? Muskets were levelled, and cannon as well! Save them from direful destruction would no men? Nay, but this woman would, -Kady Brownell! Greeted the heroine, Kady Brownell! Gone (and than God!) are those red days of slaughter! Just one more cheer for her, Kady Brownell! So, there is much more to Oliver’s story of the woman with “more pluck” than first expected. Little did Private Case realize that he was encountering one of the legendary women of the Civil War. Thanks very much for this. I’m writing a book (actually I’m finishing up edits on it right now) on women in the Civil War and ran across new information this only today — just in time, too. Oliver’s account (esp. in the previous post) backs up the other accounts of Kady I’ve been writing about. Thanks for your transcription and your research into the stories of this gentleman.